2017 March « THE BRYCE IS RIGHT! – Some thoughts on how to promote citizenship in America. My biggest concern regarding citizenship pertains to how we teach history and civics in this country. In some High Schools, “American History” runs from World War II to the present. This means students are not learning such things as the Declaration of Independence, the Constitution and Bill of Rights, the Civil War, the Louisiana Purchase, Lewis and Clark, Prohibition, the League of Nations, and much more. In other words, they only discuss the last 77 years, and not the events leading up to the founding of our country and the turmoils we had to endure. As an aside “World History” is now just World War I to the present. So much for the ancient Greeks, Egyptians, Romans, Marco Polo, the Magna Carta, Ferdinand Magellan, Alexander the Great, et al. I presume they had no bearing on our civilization. We are also not educating youth properly in terms of “Civics”; understanding our responsibilities as citizens, such as voting, serving on a jury, how legislation is enacted, or what is included in the Constitution and Bill of Rights. No wonder young people do not grasp the significance of such things as the Electoral College, the structure of our government, or what their rights are. Naivety and ignorance leads to apathy at the ballot box. In the 2016 elections, only 57.9% of the citizens voted (over 90 million didn’t vote at all). This is a pitiful figure when you compare it to other democracies like Australia, India, and the Scandinavian countries. Surprisingly, this was the highest voting percentage in the United States since 1968 (60.8%). The highest in recent history was in 1960 (63.1%) for the Kennedy/Nixon election. Even though Millennials (ages 18-35) are now the largest potential voting block, they continue to have the lowest voter turnout of any age group. Not surprisingly, immigrants coming through this program tend to appreciate this country and are more loyal than native born Americans. Another cause for this could be because there is less emphasis on teaching American government and history in the schools than in years past. In other words, the importance of being a citizen has not been impressed upon our youth. Parents could give it to their children, thereby turning it into a family tradition; civic organizations and local governments could administer it in public group settings, or perhaps some other venue. Maybe even the media could get involved and administer it over the airwaves or Internet. It should be administered in some solemn way with a right hand raised and the left hand placed on either a copy of the U.S. Constitution or perhaps a holy book such as a Bible, Torah, or Koran. 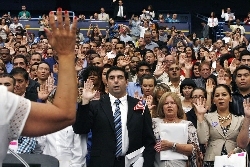 The oath is certainly not the same as the Pledge of Allegiance to the flag, this is instead a reaffirmation of our commitment to our country and would help promote citizenship and voting. Maybe this is something that should be given routinely as opposed to just one time; to remind people of their allegiance to this country. I cannot help but believe this simple gesture would have nothing but beneficial effects. One last observation, during this past year, the talking heads on television recommended avoiding any talk of politics at the dinner table, particularly during Thanksgiving, Christmas and other holidays. I disagree. We do not do enough talking at the table in a calm and reasonable manner. Instead of leaving citizenship to the school educators and MTV, parents should spend more time discussing it around the dinner table, not in a dictatorial manner, but in a frank and open discussion. I believe our youth would better understand the virtue of the Electoral College if it came from their parents as opposed to an entertainer or athlete. NEXT UP: THE IMPORTANCE OF THE FAMILY RESTAURANT – It is more important than you think. LAST TIME: TRAINING MULES – What to do when you have one in your class. – What to do when you have one in your class. Over the years I have conducted numerous professional training programs, including: Project Management, Enterprise Engineering, Systems Engineering, Information Resource Management, etc. These courses are either held at the customer’s site or our own premises. Unlike a school setting with long semesters, a professional instructor has a limited amount of time to convey his points to the students, usually just a few days at most. This can be a daunting task if you happen to have a “mule” as a student. I use the term “mule” to refer to a person who stubbornly refuses to participate in a course for a variety of reasons, mostly arrogance. Such people ignore the instructor and either sleep during the class, work on something unrelated, or wants to frequently take breaks usually to call someone on the phone or disappear from class settings. “Mules” can have an adverse effect on the class by becoming a distraction, particularly if it is a senior person. Nonetheless, as instructor you are being paid to teach specific lessons to a whole group of people, not just a few. To overcome the “mule” problem, there are a few things you can do. First, you want to avoid alienating the mule if possible. Instead, you want to get his/her support and participation. This is why introductions are so important to any class. A firm handshake and good eye contact can help establish a rapport between students and their instructor. I also ask each person to describe their title, background, and what they hope to learn from the course. This tips me off as to where their interests reside and who the potential mules might be. I also ask the students to turn off communication devices as I want to eliminate potential distractions. In addition, I tell the class what the schedule will be, how I will run the class, what kind of questions they can ask and when, and other introductory comments. I also prefer a classroom where the chairs are hard and the room is cold, thereby causing people to sit up and pay attention. 3. Openly challenge the “Mule” and put him/her on the spot. However, I only do this as a last resort. Here I will openly criticize the “Mule” for his/her behavior and try to shame them into participating. Such action may be drastic, and may invoke the hostility of the student, but sometimes you have to hit a mule over the head with a 2 X 4 just to get his attention. Some companies are actually hoping you, the outsider, will tackle this sticky problem for them. Some people will rise to the occasion only if you openly challenge them. There will be others who will feel threatened and become despondent if you go too far, which is why, as instructor, you have to be careful. Confronting a person privately during break time can also prove effective. We commonly say a person is as “stubborn as a mule” when he will not listen to other people’s advice and change their way of doing things. In a professional training class, we are trying to introduce some new ideas and change some habits. The instructor is charged with indoctrinating the students with the concepts, but it will be up to management to follow-up to assure the students are implementing what they are taught. In other words, the instructor can only go so far. One last piece of advice, in a professional training situation, instructors are not paid to be in a popularity contest. Instead, they must be resourceful and results oriented. Most of your students will follow you if you express confidence in the subject matter, but there will always be at least one “Mule” who will openly defy you. If left unchecked, their attitude can be detrimental to the class overall and you will fail in your mission. 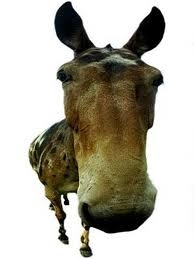 One thing is for certain, you cannot simply ignore the “Mule” as he/she will not go away. If you fail to address the problem properly, you will fail as an instructor. NEXT UP: MY TALK ON CITIZENSHIP – Some thoughts on how to promote citizenship in America. LAST TIME: THE DIFFERENCES BETWEEN LEFT AND RIGHT – Codes of conduct for both the Democrats and the Republicans. 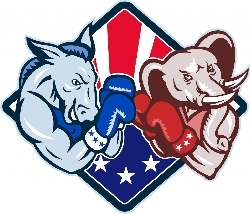 – Codes of conduct for both the Democrats and the Republicans. This is a slight variation of a Facebook posting Bernice King allegedly made, the daughter of civil rights leader Martin Luther King Jr. Regardless, it is spreading across liberal sites on the Internet like wildfire. Frankly, I found some of this disrespectful, such as “45”, “orange-ness” and “mental state.” It also hints at the hate they possess in their hearts regarding the Trump administration. There are, of course, substantial differences between the two codes, but there are also similarities, such as “Keep your message positive,” and “Take care of yourselves.” Interestingly, both sides see the other as pathological liars filled with hate. It also would seem liberals are not interested in carrying on a respectful dialog and have dismissed doing so out of hand. Both sides are also very much concerned with “fake news” which suggests both left and right do not trust the news media and are getting their facts from other sources, some erroneously in all likelihood. All of this represents the uncompromising polarity of the two parties and what to expect during the president’s administration. The Democrats will continue to voice their displeasure and try to resist any changes the president and Republican Congress tries to make. The Republicans are going to have to be more visible to keep the Democrats in check. In all likelihood this will cause a resurrection of the Tea Party to combat the liberal agenda. What we are witnessing is a desperate fight for the identity and values of the United States. There are actually more incompatibilities between the two parties than there are similarities. The scary part is that only one side can win and we may very well descend into civil war if we are not careful. Some would say we are already there. NEXT UP: TRAINING MULES – What to do when you have one in your class. LAST TIME: MANUFACTURED HATE – A destructive strategy the left is employing. – A destructive strategy the left is employing. I am honestly trying to understand why the liberals hate President Trump. Hate is a strong emotion, going well beyond “dislike.” It means you would be happy to see harm come to a person, or going so far as to do anything to eliminate the person, including violence. Since the president’s election, protesters have actively demonstrated (sometimes causing damage), Trump supporters are castigated and physically attacked, the rhetoric from the press is inflammatory, bordering on libelous, and the Democrats in Congress have adopted a policy of resistance as opposed to cooperation. There are even whispers of impeachment at this early stage of the Trump presidency. Democrat leaders are also voicing their indignation, such as Senate Minority Leader Chuck Schumer of New York who led a chant of “Dump Trump” at an LGBT Solidarity Rally. Such histrionics by the minority party was unheard of until now. All of this is occurring after Mr. Trump served only a couple of weeks in office. Of course, this began back in November following Mr. Trump’s victory over Hillary Clinton, an election which surprised not only liberals, but the news media as well. Has Mr. Trump committed heinous atrocities and initiated holocausts to exterminate people a la Adolph Hitler? Has he purged and massacred his own people as Joseph Stalin, Mao Tse Tung, and Idi Amin did? The answer is obviously, No. Yet in the liberal mind, Mr. Trump’s stature as a evil villain is on the same level as these other criminals. Since there is no evidence of blood letting, where does the anger of the left originate from? Is it because Mr. Trump possesses different beliefs than liberals, such as preferring capitalism over socialism, and safeguarding the sovereignty of the nation? A difference of opinion is certainly not a crime, at least not yet. As such, this is something that should fall into the category of “disagreement” as opposed to hating. It would also apply to just about any other Republican, not just President Trump. Is it because Mr. Trump is not considered “politically correct” by the left? Despite their rants, there is no concrete evidence that he is a racist, homophobe, anti-feminist, etc. Even if liberals are correct about Trumps’ indiscretions, it pales in comparison to those of Hillary Clinton in terms of Benghazi, the Clinton Foundation, and other earlier scandals. However, it appears she is excused because she is a woman, and Mr. Trump is not. So where does the hate come from? Maybe it has something to do with fear, such as the fear of the unknown, or more importantly a fear of change which is natural to humans. As a systems man, I am acutely aware of the problems associated with the implementation of a new system, that people will resist it as they have become content with the status quo, regardless if it has any foibles; it is what they are familiar with and what they understand. In the case of the villains mentioned earlier, they intimidated their citizens through fear of punishment or execution. President Trump has not made any such threats. Perhaps it is as simple as the left is incensed their candidate lost and another person won, with different views and values which will derail their agenda. This should be more accurately labeled as “spite” or “bad sportsmanship.” They have, therefore, assumed a position of intolerance; that there is no room for disagreement or discussion, which presents a genuine threat to free speech and free thought. In the process, this is forcing people and businesses to chose sides and escalate boycott wars. Fearing repercussions from the left, retailers and other businesses have turned a cold shoulder to anything with the Trump brand in fear they will lose business. As they do so, Republicans fight back by boycotting these establishments, and the political divide grows deeper. Do liberals honestly hate President Trump? I believe so. Is it justified? Not really. Yet they will continue to vilify him and poison our culture with hate. Will everyone buy it? No, only the naive person who doesn’t possess an understanding of our government or history will fall for it. The “Silent Majority” will not and likely will grow restless the louder the rhetoric gets. The refutation of Trump is not as massive as the left would have us believe. However, they own the media and are carefully choreographing the images we see, thereby altering perceptions. When the president calls them out for fake news, the media is incensed as no other president in recent memory had the audacity to push back. All along, the Democrats have claimed Mr. Trump is unfit to serve office. His election represents a rebuke of their liberal values, which is a bitter pill to swallow. 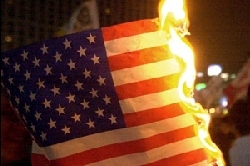 Consequently, the strategy of the Democrats has become a matter of manufacturing hate in order to turn the nation against the president. By embarking on such a campaign, they increase the political divide of the country. Using hate as a political weapon is certainly not new, as it has been used for centuries to create enemies, real of fallacious, in order to motivate the people to some end. However, we seem to have perfected the tactic here in the 21st century. The fact is, people hate Trump because they have been told to hate him, not because they have come to this conclusion on their own. As such, manufacturing hate is slanderous behavior as it is recommending a reckless and destructive course of action. There is one side-effect I do not believe the left has counted on, specifically that Mr. Trump is a competitive person; as he comes from the world of business, the more he is challenged, the harder he works as he doesn’t like to fail. In other words, manufactured hate will only inspire the president to succeed. If he does, the fate of the left is sealed. NEXT UP: THE DIFFERENCES BETWEEN LEFT AND RIGHT – Codes of conduct for both the Democrats and the Republicans. LAST TIME: HANDLING FAILURE – Failure is something we don’t handle very well as a species.